I’m sure you’ve already heard Apple’s big announcements from the annual Worldwide Developer Conference this week. I was lucky enough to snag a ticket in Apple’s lottery and got to check it all out in person. There were lots of great sessions, with tons of content. Here are the highlights as I saw them from a mobile developer’s perspective – *not* from the general consumer point of view. For the most part, I think this year’s announcements highlighted the evolution and maturity of existing products and projects – no new amazing breakthoughs, but definitely steps in the right direction. If you haven’t seen them already, the Keynote and the Platforms State of the Union videos cover most of the announcements, but not in complete detail. Just be warned, the Keynote is loaded with product marketing fluff, not just developer topics. Once you get to “we’ve got one more thing…” you can turn off the Keynote – the Apple Music announcement has pretty much zero significance for developers. There was a tremendous emphasis on the Swift language at this year’s WWDC event. There was the announcement that Swift is going to be open sourced, plus many language enhancements, and nearly every piece of sample code that was shown was written in Swift. It is very clear that Swift is Apple’s direction moving forward. The Swift language itself has also evolved quite significantly. Better error handling, protocol extensions, and improved performance are a great start. Heck, if I understood one of the speakers correctly, it’s now even faster than Objective C at runtime in some cases. New versions of both OS X and iOS were announced and released to developers… OS X El Capitan and iOS 9 respectively. Both seem to be incremental updates of the previous OSes. New apps, new features, etc… for the end users. Not necessarily significant changes for developers. If you’re a graphics programmer, Metal will be a big deal for you (low level graphics/gpu API), but if you’re not a graphics guru, you probably won’t even know its there. The new iOS 9 multitasking/side-by-side mode for iPad is going to be a great addition which brings the iPad even closer to being a full laptop replacement. Having the ability to have multiple apps open next to each other will improve the iPad’s “get $h1t done” ability. You’ll have to ensure that you’ve authored your apps to leverage adaptive layouts, but that’s pretty much all that you need to do to take advantage of iPad Multitasking. The new “App Thinning” features in Xcode 7/iOS 9 are also a great addition. Currently if you build an iOS app it gets bundled with lots of resources that may never be used depending on the type of device. App thinning introduces three concepts that help minimize the footprint and increase the quality of your installed apps: App Slicing, On Demand Resources, and Bitcode. According to the presenters, these can decrease the download/installed size of your apps quite significantly. If you haven’t seen the App Thinning in Xcode session, you should definitely check it out. App Slicing is a new feature that creates variants of your app executable depending on the device that you are downloading the app to. So, if your app doesn’t use @3x graphics, or doesn’t use the arm7s architecture on a particular device, then they won’t be downloaded. Likewise, if your device does leverage those assets, then the other smaller scale assets and non-used binaries won’t be downloaded. On Demand Resources give you the ability to download specific sets of resources from the app store as they are needed. They are still hosted by the app store, but not part of the initial download. Let’s say you are building a platform game. Initially the shell/navigation assets will be downloaded. While the app is running you’ll be able to download assets for level 1, level 2, level 3, etc… incrementally as they are needed. The system can also clean up ODR resources to conserve space using a least-recently-used cleanup routine. Bitcode is an intermediate representation of a compiled program. Apps you upload to iTunes Connect that contain bitcode will be compiled and linked on the App Store. Including bitcode will allow Apple to re-optimize your app binary in the future without the need to submit a new version of your app to the store. Bitcode enables the app store to re-compile your code to take advantage of new LLVM optimizations without you even having to recompile and upload a new application binary. The new UI testing features in Xcode 7 look pretty awesome as far as automated UI testing goes. It enables you to record/playback steps and generated UI unit tests all from within Xcode. 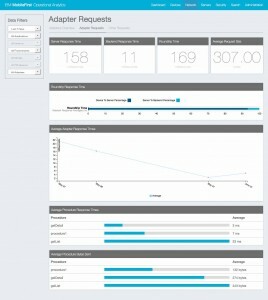 What’s even better, it enables you to set breakpoints within your tests, so you can debug why your tests might be failing, or you can set breakpoints inside of your app, and the automated testing stops at the breakpoints and allows you to step through code while inside the automated unit test. Definitely do not miss the session on UI Testing in Xcode 7 if you have any (even remote) interest in automated UI testing, it looks pretty darn useful. Last, but by certainly no means least, the announcement of watchOS 2 looks like a massive leap forward for developing for the Apple Watch. WatchOS 2 brings us the ability to execute code natively on the Apple Watch, not just in the WatchKit extension running on your iPhone, brings us the ability to implement custom watch complications, access to network connectivity if your phone is not connected, support for multimedia, and direct access to hardware sensors. If you’re wondering what “watch complications” are, they are the widgets on the watch face that enable you to display customized information. Also, don’t forget the watchOS docs, which are chock full of resources and a watchOS 2 transition guide. There are also new APIs, enhanced features in CloudKit, MapKit, HomeKit, Core Motion, Core Location, updates to Apple Pay, security updates, networking updates, and lots more. Be sure to check out the complete list of WWDC videos for more. There was so much to absorb, I’m sure I missed something, so feel free to point anything out that I’ve overlooked! 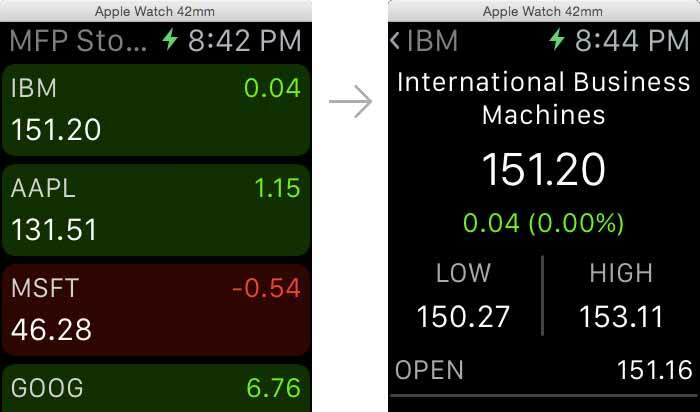 This is the third entry in my series on powering Apple Watch apps using IBM MobileFirst. 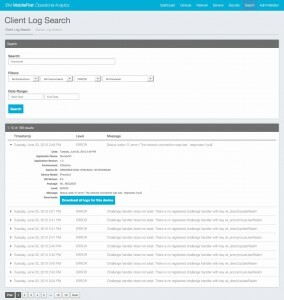 In the first post I covered setting up the project, remote logging, and analytics. In the second post I covered bidirectional communication between the WatchKit extension and host app (not really MobileFirst, but still applicable). In this post we’ll examine how to consume data from the MobileFirst Foundation Server inside of an Apple Watch app. If you’re already familiar with consuming data using MobileFirst Adapters, then guess what… it is *exactly* the same as consuming an Adapter in a native iOS project. Since the logic for a WatchKit app is executed in the WatchKit extension, which is actually an executable that runs on the phone, there is no difference between between the two. The basic process was this: build out the Apple Watch apps user interface in Xcode/Interface Builder, build the adapters to expose the data, then start consuming the data within the WatchKit extension to deliver it to the watch app interface. So, lets first look at the app interface. I have two views that were built in Interface Builder. One is a table that displays rows of data, one is a details screen which has lots of labels used to display data. In the main interface I have a “loading…” label (that is hidden once the data is loaded) and a table that is used to display data. For each row in the table there are 3 labels to display specific data fields. These were connected to IBOutlet references in the view controller class. All of these are straightforward WatchKit development practices. Be sure to check out the WKInterfaceTable class reference for more detail on working with WatchKit tables. For displaying the details screen, I also used very similar pattern. I added labels for displaying data, and linked them to IBOutlet references in my view controller so I can change their values once the data is loaded. Loading data into a WatchKit extension is identical to making a request to the MobileFirst server adapter from a native iOS app. I did use my helper class so I can use code blocks instead of the delegate patter, but the implementation is exactly the same. [?] What type of adapter would you like? 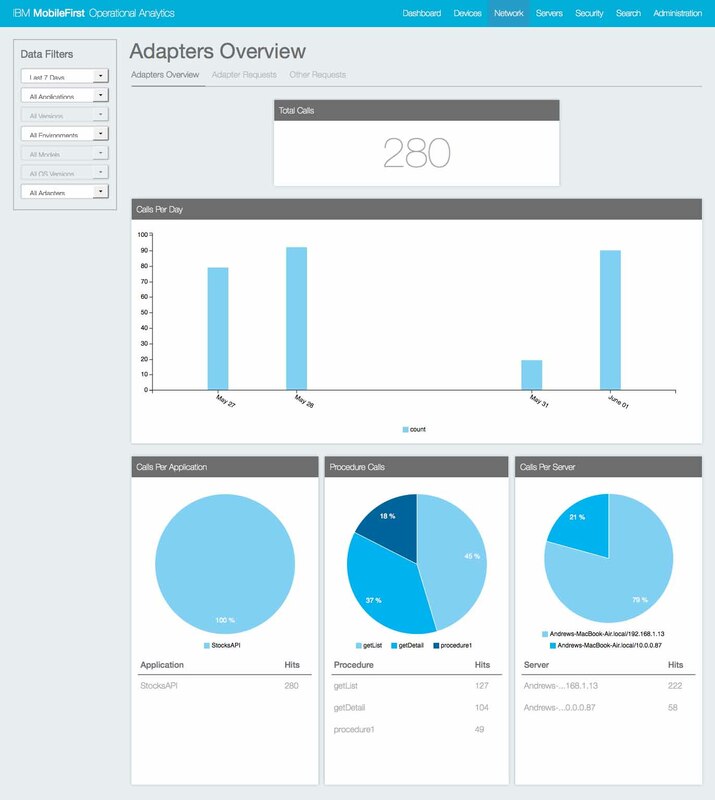 Adapters can be used to easily connect back end systems to mobile clients. 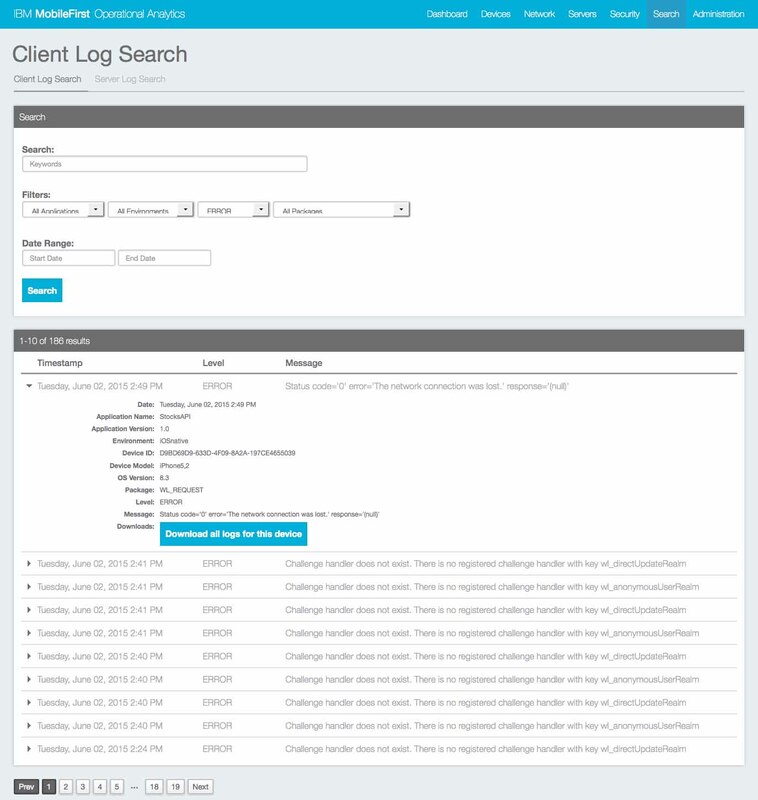 You can quickly and easily expose data from a relational database, or even consume data from http endpoints and easily serialize it into a more compact mobile-friendly format. 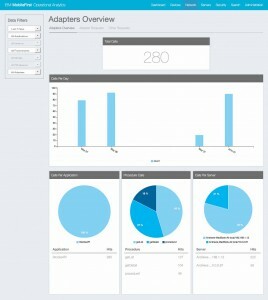 You should definitely read more about MobileFirst adapters through the platform documentation for more detail. All of the data I am displaying is simulated. I’m not actively pulling from a relational database or live service. However, you could use a very similar method to connect to a live data repository. Once these are deployed to the server using the CLI “mfp bd” command, you can invoke the adapter procedures from a client application, regardless of whether it is native iOS, native Android, or hybrid application. Once you have the data within the WatchKit extension, we can use it to update the user interface. For the data table implementation, you simply need to set the number of rows, and then loop over the data to set values for each row based on the WKInterfaceTable specification. For the detail screen we’re also doing things even more straightforward. When the screen is initialized, we request detail data from the server. Once we receive that data, we’re simply assigning label values based upon the data that was returned. Ready to get started? Just download the free MobileFirst Platform Server Developer Edition, and get started. We’ve been able to write native iOS apps leveraging the scaffolding and analytics of the IBM MobileFirst Platform Foundation Server for a while now. 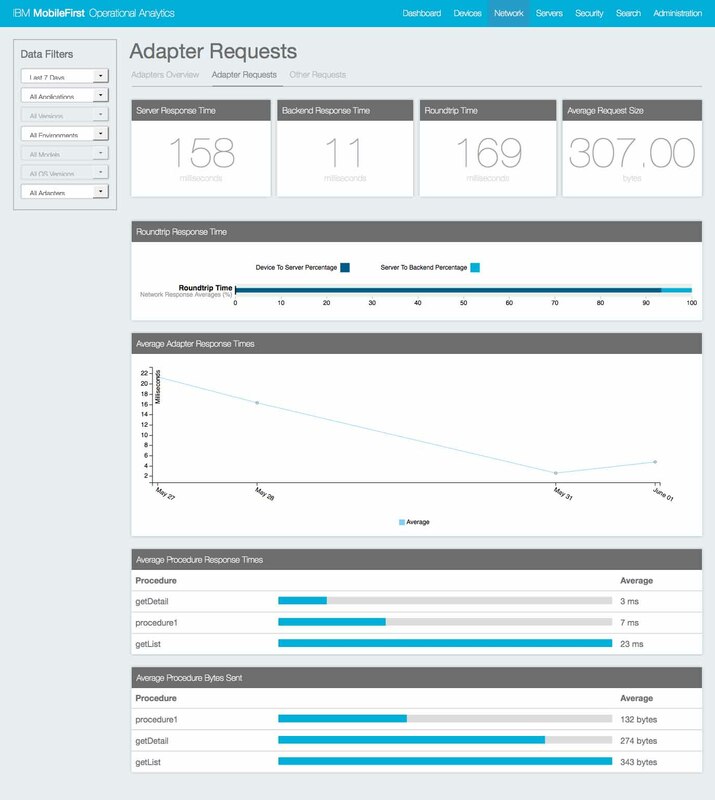 This was first introduced way back when MobileFirst still went by the Worklight name, serveral versions ago. As I would write apps, one thing I really wanted was to use code blocks instead of having to implement delegate classes every time I need to call a procedure on the MobileFirst server. In MobileFirst 7.0, the new WLResourceRequest API allows you to invoke requests using either the completionHandler (code block) or delegate implementations. But… what if you’re still using an earlier version of the MobileFirst platform, or what if you still want to leverage your existing code that uses WLProcedureInvocationData parameters, but don’t want to have to create a new delegate for every request? Well, look no further. I put together a very simple utility class that helps with this task by allowing you to pass code blocks as parameters for the requests to the MobileFirst (or Worklight) server. Right now it only contains two utlitiy methods, but I’ll update it if I i come up with anything else useful. The invokeProcedure method allows you to invoke a procedure and pass code blocks for success/error callbacks inline, without having to define delegates. I normally prefer code blocks b/c they allow you to encapsulate functionality inside of a single class, instead of having logic spread between a controller and delegate class (and having to worry about communication between the two).